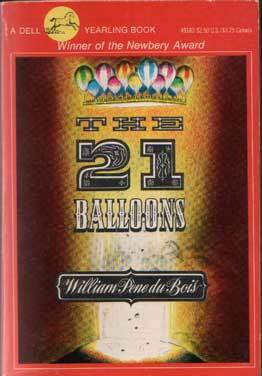 The 21 Balloons was written and illustrated by William Pene du Bois. It won a Newbury award in 1948. It certainly deserved it. This book entertained me when I was a kid and it gets better every time I read it, which is often. The story is told in flashback by Professor William Waterman Sherman, a math teacher. After years of teaching, Professor Sherman is royally sick of children and of teaching math and he decides to spend a year in a hot air balloon. 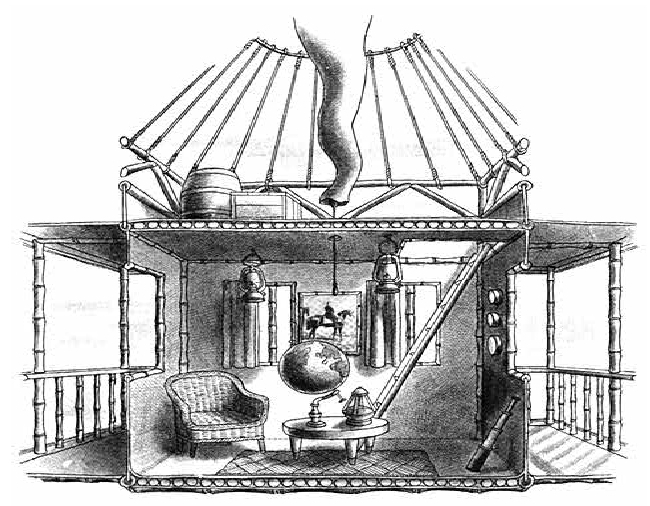 Well, not IN the balloon, obviously – in a house suspended from the balloon. All goes well for the first seven days – and then a sea gull encounter causes Professor Sherman to crash land on the island of Krakatoa, where he is greeted, to his utter amazement by a dapper man with a big secret. The character of Professor Sherman is so consistently without sentiment that he’s wildly refreshing. I wouldn’t want to spend a year in a balloon with him, but so many people in children’s literature are very nice, or very evil, that someone like the Professor is a refreshing change of pace. He’s not evil, he’s not cruel, but he’s interested in his own well-being. Not to the point of being without morals, but enough to, for instance, fail to mention that he’s a retired teacher to a group of people who would doubtless pressure him to come out of his much beloved retirement. The real excitement comes not from the plot or the characters but from the details. Every detail of the balloon house is described, and it makes you wonder what your house would be like. What would you invent if you were apart of a group of very rich, very smart people with a lot of resources and leisure time? What would your constitution look like if you drew one up from scratch? And how many ways are there to cook lamb, anyway? These are pressing questions in the book and they will keep you daydreaming long after the book is over. Look at these illustrations, aren’t they wonderful? I deeply regret that I am unable to share my personal favorite: Professor Sherman being pulled by his balloon across the surface of the ocean, with sharks nipping at his bare toes. 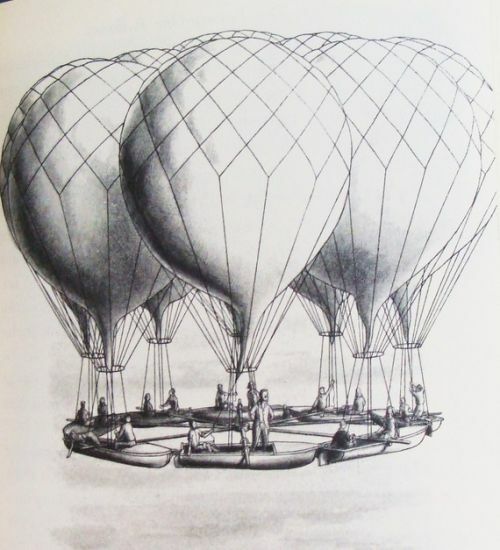 The Balloon house. Not pictured are a great many books (paperback, small print). Don’t you want to go read the book right now, and then start drawing pictures of your house on Krakatoa and your own balloon invention with a new box of crayons? OK, go do that! I guess if there’s any problem with the book, it’s that it’s rather tasteless to make light entertainment out of a disaster that caused the deaths of over 36,000 people. As a child, I had no idea that there was a real Krakatoa – you can imagine my surprise when I discovered it. It seems deeply unfair that that horrible tragedy was real and yet we do not have elevator beds and airy-go-grounds. Since the real explosion happened in 1883, perhaps its not, as they say, “too soon” to turn it into a fantasy about living in a place so unstable that no one will ever look for you. Just watch out for Anak Krakatau! This entry was posted in Book Reviews and tagged 21 Balloons, Aviation, balloon, Bois, Book, Children's Books, fantasy for children, Hot air balloon, Krakatau, Krakatoa, science fiction for children, Sherman, Twenty-One Balloons, William Pene du Bois.